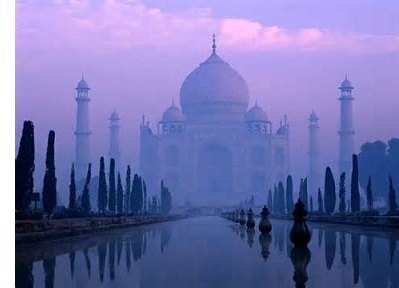 Taj Mahal - The Taj Mahal ("Crown Palace") is simply one of the most beautiful buildings on earth. It is a white marble mausoleum located in Agra, India in the northern state of Uttar Pradesh. Built at the height of the Mughal Empire, it represents the pinnacle of Mughal society; although it combines elements of several cultures. Just as another famous mausoleum, the one at Halicarnassus, blended ancient Greek, Persian and Egyptian architecture, so also does the Taj Mahal incorporate Medieval Islamic, Persian and Indian architecture. Emperor Shah Jahan (the grandson of Akbar the Great) ordered its construction as the final resting place of his beloved wife, Mumtaz Mahal. Construction began in 1632; the building was completed in 1648, and the entire complex (surrounding buildings and garden) was finished by 1653. Materials for the building were gathered from all over India and the marble is inlaid with precious stones that were collected from across Asia. The jasper is from Punjab, the jade from China, the sapphire from Ceylon (Sri Lanka), the turquoise from Tibet, the carnelian from Arabia and the lapis lazuli is from Afghanistan. As with many things throughout history, there are several legends associated with the Taj Mahal. One is that, upon its completion, Shah Jahan was so impressed that he ordered the death of its architect (Ustad Ahmad Lahauri) so that he could never create anything of equal or greater beauty. Another is that Shah Jahan planned to build a second identical Taj across the Yamuna River, except that it would be made of black marble instead (which would have been really cool). Only his overthrow by his son in 1658 prevented this. There is no evidence to support either legend, however.